The race to a fully connected house has been going on for some time now, but it’s just recently that one of the biggest players in the game has arrived to steal the show. The device maker in question is Apple, and its play into the IoT space is called HomeKit. We’ve covered the app and the devices that work with HomeKit with in detail elsewhere, but the short version of the story is that devices with the Home Kit branding will all work together in one ecosystem that’s run by Apple. For many’a Apple owner, the HomeKit ecosystem is a dream come true. For the rest of us, however, it’s not so great. Instead of wallowing in our lack of inclusion, however, we’ve done something a little more productive with our time and compiled a list of ecosystems and devices that you can buy into right now, only one of which requires iOS to operate. Our starting point? Samsung’s SmartThings, the old mainstay. This one has been around forever and, as far as we can tell, has the most devices under its umbrella. Talk about platform-agnostic, Samsung’s SmartThings is probably the most egalitarian option on the list with the most available devices under its banner. From lighting options from Philips, Leviton and OSRAM, to thermostats from Honeywell and Ecobee, to both major smart speakers – Google Home and the Amazon Echo family of devices – the list of products compatible with Samsung’s SmartThings platform seems to go on endlessly. That said, because no one has the time (or the budget) to go through and test out all the options, a good starting combination would be a Honeywell Lyric Thermometer, Samsung SmartCam HD Pro Camera, Skybell HD Video Doorbell and an Amazon Echo to give you the option of speaking specific commands rather than finding your phone every time you want to use a smart device. OK, caveat time: while Samsung definitely doesn’t need Apple’s permission to sell smart home products, it does require that you purchase a Samsung SmartThings Hub before you dig into any of its interconnected wares. The Hub plugs into your router at home and allows you to control your smart home devices whenever and wherever you go. The Home is powered by the Home Assistant, which is in charge of parsing commands given to the speaker and relaying pertinent information to the other devices in the home. On top of the physical devices that can be controlled on an individual basis, Google Home also connects to IFTTT (recipe-based smart device software) and is one day expected to hook into SmartThings. Until then, however, the best place to start with the Made by Google platform is with the $129 (around £100, AU$170) Google Home speaker, a Chromecast, a Nest thermostat, a couple of LIFX lightbulbs and Google’s strange new Google WiFi router. While you’ll have an easier time controlling smart home devices via voice commands through Google Home, or through an interconnected hub like Samsung’s SmartThings, you don’t always need one. There are plenty of app-based options out there that will allow you to “string” connected devices together without additional hardware. The one I’ve tested the most is called, somewhat ironically, Stringify. It’s available only on iOS at the moment, but the idea here is that once you get in the devices you want to use (Stringify not only supports traditional smart home devices, but also other applications like Evernote, Reddit, Twitter and Slack), all you need to do is connect them to your main Stringify account – no additional hardware required. Once connected you can then create “flows” to string multiple devices together. One example could be that when you get close to home (the app can pull your location at any time if you enable it), you want to turn up your thermostat, start some music and turn on your Philips Hue lights. Can’t find a flow you like? Stringify invites you to create flows of your own via its drag-and-drop interface that’s sort of like Legos meets low-level programming 101. 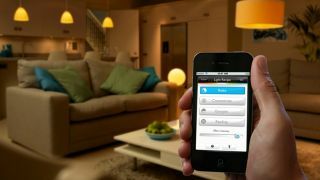 If you live in the UK, you might want to check out Zipato or VeraPlus, two popular options there, while those living in Australia should look at Z-Wave or Insteon for their smart home fix. Don’t see your favorite smart home ecosystem on the list above? Let us know which one you recommend in the comments below.